Its face may be a bit plain, but its heart is golden. The response to my proposed DIY Phono Preamp project has been a bit tepid. So, once more with feeling: WoS is looking for a patron to finance this project. The kind person that fronts this project will, at the end of it, receive a phono stage very similar to the one pictured here. The preamp pictured here (my prototype) uses a Tubecad Tetra phono amplifier board and PS-3 power supply. It is a bit of a mashup from bits and pieces I had laying around, but it works very well. Note: The patron of this project will not receive my prototype unit pictured here. He or she will receive a new Tubecad phono stage and power supply, with boards and all parts on them as supplied in the full Tubecad kit. Note also: A nice chassis like the one shown here will be included with the finished unit. All the construction is included also. To summarize: The finished phono preamp (tubes included) will be ready to plug and play. The person that funds this project will get the metal working needed on the chassis, PCB assembly, wiring and testing provided by yours truly, in short, all labour, free of charge. She or he will only pay for the boards, parts, chassis and shipping. 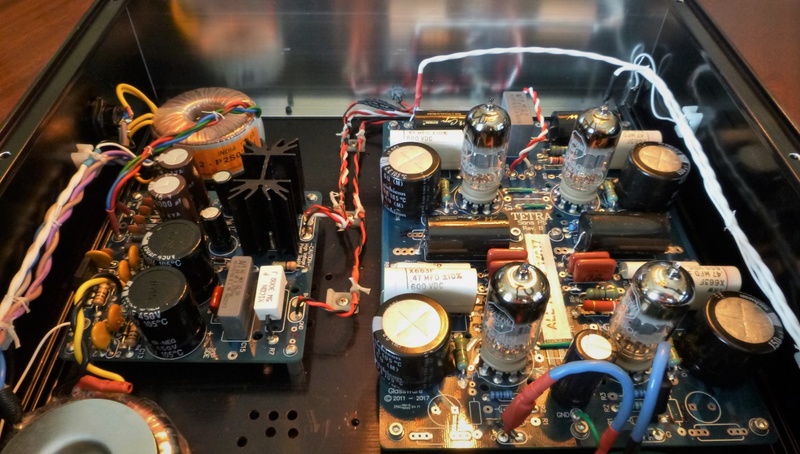 The total cost of the completed phono amp shouldn’t exceed $500 US (~$700 Cdn) plus shipping. Again, this is not a “for profit” proposal…the amount of free labor being included is substantial! If a potential patron is sitting on the fence and not sure of how this phono preamp will sound, I can send them some short 24/96 FLAC files from LP’s, as captured by my phono front end, the prototype preamp shown here, digitized by my Schiit JIL A to D converter. An eBay-sourced chassis will be used to house the Tubecad Tetra Phono board, PS-3 power supply board and two toroidal transformers. We’ll even used a Tubecad power switch for a gentle start-up on the tubes. The aim of the project is to photograph and document the build of the sponsored unit so that other Wall of Sound readers can build their own if they wish. The TubeCad phono preamp project (once a kind patron can be found) will be similar to, but easier than, the line stage project from a year or so ago. For prospective builders: no outside help will be required for metal working this time around. A hand-held drill, a ruler, a few drill bits, a counter sink or two, a centre punch, screw drivers, a soldering iron and a bit of wire are all that’s required. There won’t be any drawings to follow this time around. Chassis layout will be possible by simply following pictures accompanied by brief text. A professional looking, and sounding, result is all but assured. Tube-shy audiophiles concerned about the cost of re-tubing needn’t worry. A fresh set of four tubes can be had for about $50 US. The prototype shown in the pictures powered up without drama and went about its work amplifying without any fuss or bother. An audiophile friend owns a Tetra and has used it daily for over two years without incident. So, if anyone would like to fund this project and get a really decent phono preamp that would compete sonically with commercial units costing upwards of $2,000, please drop the WoS editor a line at info@wallofsound.ca and he will pass it along to me. Editor’s Note: I was also a very pleased recipient of Steve’s Aikido linestage, and I recently bought the excellent RJM VSPS400 DIY Phono that Steve built, with the proceeds going to charity (I was the only bidder). Having seen my share of DIY projects over the years, I can vouch for (a) the quality of Steve’s work, it’s absolutely first rate, and (b) that his projects happen quickly – you won’t be waiting months for this to materialize! So, proceed with confidence.